On the newsstand, women, people of color, and LGBTQ folks are underrepresented. Photo by Rebecca Peplinski (Creative Commons). Sometimes as I’m paging through a magazine, I’ll get a sinking feeling. “Wait a second,” I think, “Is every article in here written by a man?” For magazines I subscribe to, I’ll occasionally even go through and do a rough tally of the gender breakdown of bylines. I think about this issue personally because I’m a writer and editor who cares a lot about who gets hired to write articles—and who doesn’t. The gender imbalance in who makes our media has big repercussions throughout society, impacting what issues get covered, whose voices are valued as experts, and whose work is celebrated. For the past six years, the research-driven organization VIDA has been crunching the numbers on the gender of bylines in literary journals and publications. Their team of volunteers take my page-by-page tallying to a whole different level, analyzing the demographics of who got published over the past year at 41 different literary media outlets, including Harper’s, The Atlantic, The New Republic, and The New Yorker. 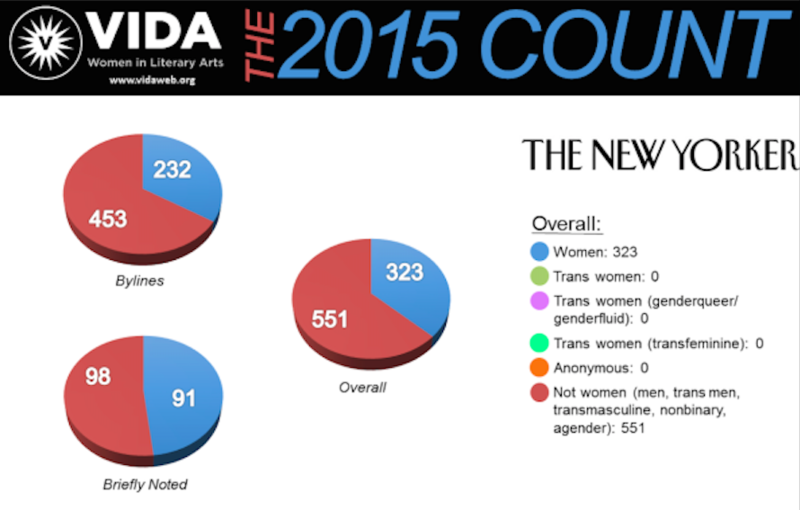 This morning, they published their most recent report, the 2015 VIDA Count. For the past two years, VIDA has also collected data on the race of published writers. The group sent out surveys to women writers whose bylines were seen in the fifteen highest-profile publications they analyze, asking the writers to self-identify their race and ethnic identity. This year, they expanded that survey to also ask for the writer’s sexual orientation, gender identity, and whether they have any disabilities. Roughly half of the 1,400 writers VIDA reached out to responded to the survey. The hard data from the VIDA count reveals a complicated picture. Many of the publications analyzed by VIDA volunteers have shown a marked increase in the number of women they publish and the number of books by women they review. For example, in 2011, women had only 24 percent of bylines in The New Yorker and only 33 percent of the books the magazine reviewed in its “Briefly Noted” section were by female authors. In 2015, the number of female bylines increased to 33 percent and female authors made up 48 percent of the “Briefly Noted” section. That’s a sizable increase. But still, it’s hard to celebrate when the bylines at The New Yorker tilt so heavily male. 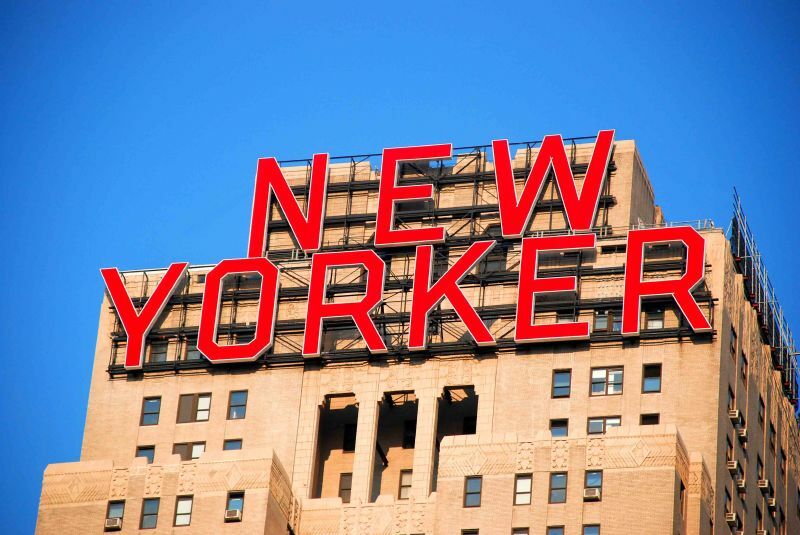 Having gender parity in journalism isn’t some sort of quixotic goal—there are certainly enough great female writers in the world to fill every issue of The New Yorker for a year. On the other hand, some outlets actually published a slightly lower percentage of female writers in 2015 than they did in 2011, like The Nation and The Paris Review, so at least The New Yorker is moving in the right direction. The New Yorker: Now with nine percent more women! Photo via Creative Commons. Radical change doesn’t come overnight, but it’s reasonable to demand a major shift over the course of five years. Some publications have made a significant effort to increase their gender parity. In the first year of the VIDA Count, literary journal Tin House published the work of only 14 women—31 percent of its total bylines. This year, they published 76 women, reaching an equal balance between male and female bylines. 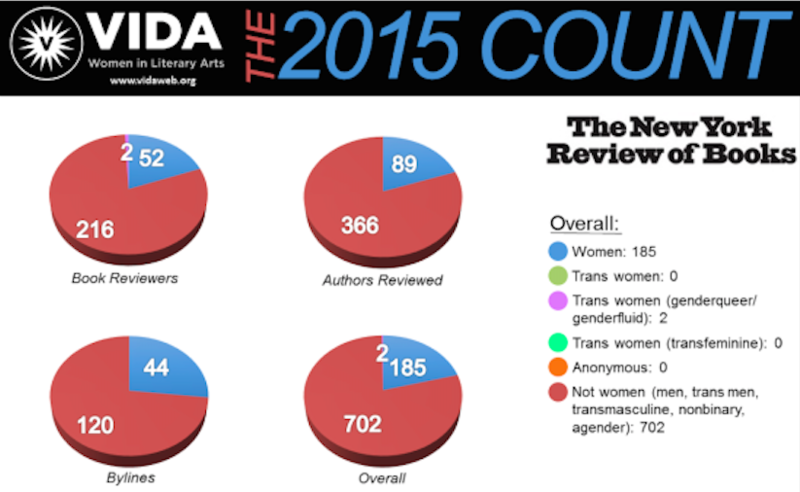 This is the first year that the VIDA count has asked about the gender identity of the writers it surveys. The results reveal the lack of representation you might have suspected: Seven of fifteen publications included in the main count did not publish a single article by writers who are trans women or genderqueer/genderfluid. Among the publications who did publish writing by trans women, the highest rate of publication was at Poetry—where their work composed a mere 0.8 percent of bylines. A similar lack of representation is revealed for women with disabilities: six of the fifteen publications in VIDA’s main count didn’t publish any work by women writers who identify as having a disability. It seems relevant to note here that according to the CDC, about 27 million women in the U.S. have disabilities. But their voices don’t show up in many literary publications. 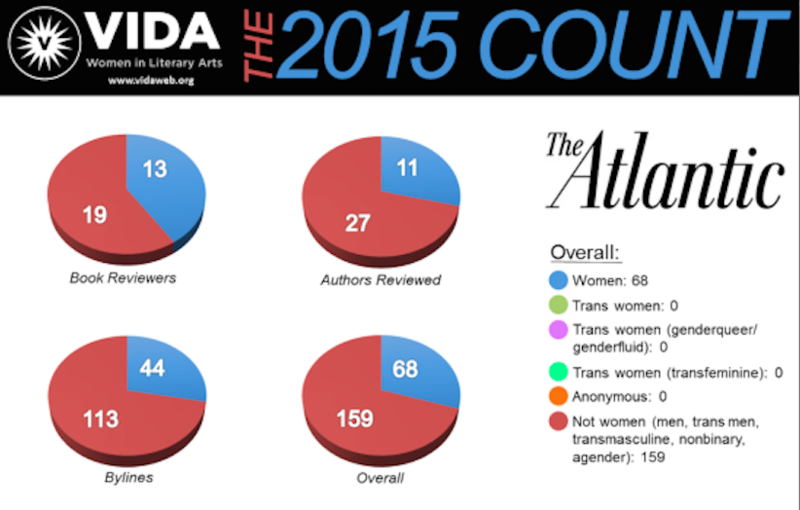 Three examples from the 2015 VIDA Count. The revelations for race and sexuality are also a very mixed bag. Rates of publishing work by women of color are not in any way uniform across the publications. Instead, the numbers are all over the board, but almost always not reflective of the diversity of our society. Based on responses to VIDA’s survey, 36 percent of the 47 female writers at The New Republic were women of color, 15 percent of the 66 female writers at the Nation were women of color, and eight percent of the 24 female writers published in Harper’s were women of color. Publication of LGBTQ writers also varied greatly. Over 45 percent of the female writers published by Tin House, Poetry, and Granta did not identify as straight. Other literary outlets published only a few LGBTQ writers, with the straightest publication being The Atlantic: Out of the 20 female writers published there who replied to VIDA’s survey, 19 identified as straight. Welcome to the first BitchReads of 2018!